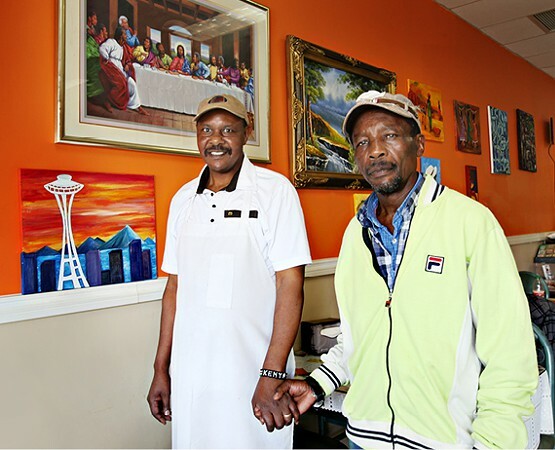 Ken Anderson and Lenore Sharp knew they were taking a risk when they opened their ice-cream shop, Full Tilt Columbia City, in a small, dingy plaza just off of Rainier Avenue six years ago. “When we first moved in, the parking lot was shady. There was a storm fence across the front with plastic woven in, so you couldn’t see anything going on in here,” Anderson recalled. “There was barbed wire on top. And inside it was basically an open-air drug and prostitution market.” Sharp’s mother, who was visiting from out of town at the time, was horrified. But Anderson and Sharp were optimistic about the location. Like their friends Justin Cline and Ann Magyar, who founded the Full Tilt in White Center, the couple believed their business could create a safer, more active community in their diverse neighborhood. Today, their vision looks like it has become a reality: The barbed-wire fence is long gone, and the little plaza has become home to more than half a dozen businesses, including Hummingbird Saloon (which is also owned by Anderson and Sharp, along with family members Steve and Bridget Sharp), microbrewery Flying Lion, Kenyan restaurant Safari Njema, and Vietnamese eatery Watercress Bistro. There’s also a Vietnamese hair and nail salon, Mexican tienda, African convenience store, and Kenyan dance hall. In a gentrifying South Seattle neighborhood that was once mostly black, with a significant Latino and Asian population, the plaza serves the many tastes of its community. By all accounts, the retail strip is a mutually beneficial environment for business owners, who patronize each other’s establishments and encourage their customers to do the same. It would be nice when you publish these stories, to include the address.